Though I still haven’t seen it a second time, after a weekend of mulling it over, “The Longest Daycare” is doing that thing that high quality movies/television shows/books do where it gets better the more I think about it. The story is sweet without being saccharine, exciting without being scary, and plausible without being fanciful. 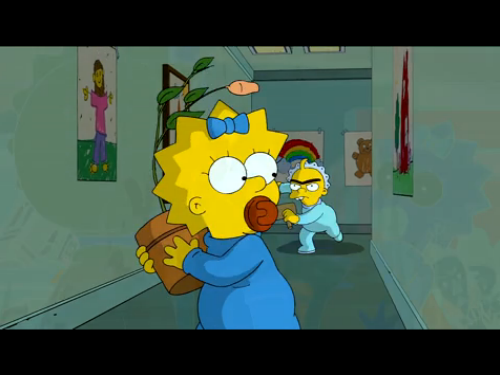 The animation is very similar to the movie and HD Zombie Simpsons, but there’s a not-quite dreamlike quality to it that makes it fit in will with a story that’s told from the perspective of a baby. Finally and most importantly, “The Longest Daycare” has a genuine sense of humor to it, one that doesn’t feel repetitive or played out. The last part comes about in no small part because the format of “The Longest Daycare”. 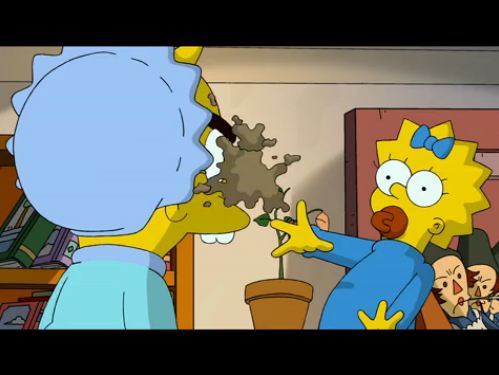 A dialogue free short film leaves no room for the typical comedy and story telling problems that plague Zombie Simpsons and spoiled the movie. Since there’s no Homer, no need to stretch things to fill an arbitrary runtime, and no dialogue of any kind, “The Longest Daycare” is protected from Jerkass Homer acting insane, pointless celebrity voice cameos, dull exposition to explain whatever nonsense is happening, and the need to stretch jokes and ideas as a way to kill time. By operating in a new format that makes so many of the usual shortcuts unavailable, “The Longest Daycare” is free to both indulge its imagination and tell a simple story without getting bogged down in ill timed act breaks or any of the other routine necessities of television. The result is a short story about Maggie, Gerald (the baby with the one eyebrow), and a caterpillar that she wants to protect and he wants to squish. The setup is simple but sturdy, and the short moves along briskly while covering quite a bit of physical and emotional ground given that it takes place at a daycare center over only a short time. The ceiling and cabinets are all much higher off the ground than he is, but not from Maggie’s point of view. The short uses this kind of perspective a lot, so that we see things the way Maggie would see them, both physically and emotionally. For example, when Marge drops Maggie off, she walks down a hallway away from Maggie, but we don’t see it as a straight passageway, instead it’s got an arc to it that exaggerates the distance and reinforces the fact that we’re seeing it the same way a baby sitting on the floor would see it. Even though Marge is only a few adult steps away, by Maggie’s standards she’s much further. From a strict size perspective, neither of these shots makes much sense. Look how large she and Gerald are compared to the hallway, how close in the bookshelf and the paining look, to say nothing of how close Maggie must be to Gerald as she tosses the dirt. But they do an excellent job of conveying how Maggie feels, that Gerald is this massive, close-in threat. None of this is accidental, Maggie is the undisputed star of “The Longest Daycare”. It’s a story where the audience gets to follow her, and root for her, and sympathize with her, and so it’s told from her point of view. 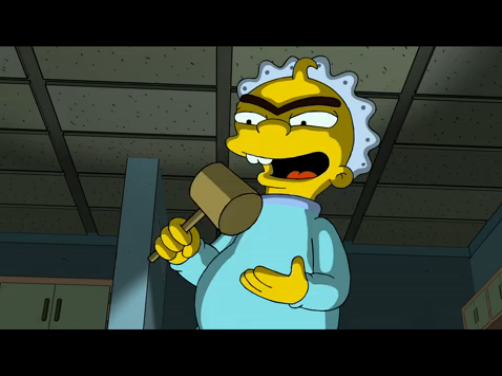 So while the animation isn’t as technically impressive or “ooh-ahh” worthy as, say, Pixar’s La Luna (which appeared before Brave), it’s much more entertaining than the usual HD animation on Zombie Simpsons because it doesn’t look like stale computer templates, but rather like a living part of the story. The soundtrack, which I’m pretty sure was done by Hans Zimmer (though it isn’t on his IMDb page yet) kept things bouncy and moving, though I can’t recall any part that really stood out as memorable. And there were a few things that seemed excessive, unnecessary, or out of place. But on the whole, “The Longest Daycare” was very good, and I look forward to seeing it again whenever it manages to hit the internet or home video. In the meantime, if you happen to find yourself in a big multiplex sometime in the next week (cough, Batman 7, cough), duck into an Ice Age 4 theater about fifteen minutes after the listed showtime and watch “The Longest Daycare”. (I didn’t see it in 3D, anyone could’ve just walked in.) It really is worth seeing, and I’m slightly surprised that even at No Homers (in this thread or this one), very few people went out to see it this weekend. Sure, it’s only five minutes, but it’s still Simpsons on the big screen, and it’s definitely fun. It sounds like the best piece of Simpsons-related animation in a long time. Nice to hear! In the thread in your first No Homers link, someone posted this shot. Are those speaker-like things a Day of the Tentacle reference? The colour scheme makes it look like they are! It’s possible, but they’re only on screen for a second or so. There are a lot of background details I’m curious to see once I get my hands on a copy that I can pause, rewind and fast forward. Interesting that this short actually seems to be pretty good. 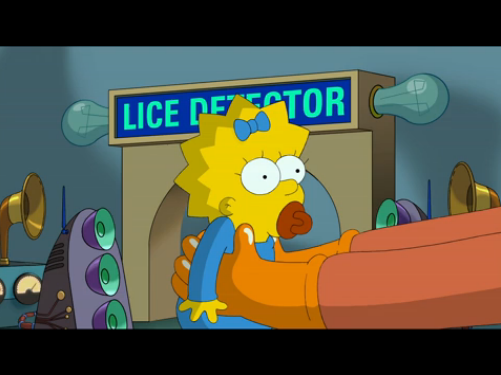 If you think about it, though, it kind of makes sense because Maggie is the one Simpson who hasn’t been played out to death already, so there’s more room to do things that are fresh and new. It also forces them to take a different approach to storytelling. It kind of takes me back in a way, because I remember Maggie being arguably the funniest character back in the Tracy Ullman days. There were a lot of good little sight gags, and her being a silent character worked in the very short format. And it probably works here for similar reasons. Unfortunately I don’t live in the USA, so I’ll have to wait to see it. Yeah, Maggie’s a very hard character to screw up, mostly because she relies on almost entirely on silent humor. There’s a lot that can be done with her, but she’s been relegated to the background in recent seasons, so I do think a short revolving entirely around her sounds interesting. I have no desire to see Ice Age 4, so I’ll wait until the short turns up elsewhere. I want to see it, I just don’t go to theatres. I definitely intend to sneak a watch at this when I’m seeing Dark Knight this weekend; hopefully I can time it right to see a 3D showing. Thanks for the shout out! Happy to provide the screencaps.